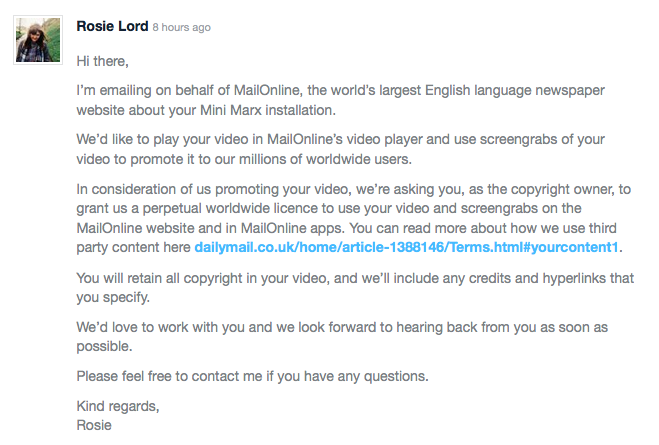 Today Rosie Lord of the Daily Mail contacted me (see below) asking if they could use a video that I had posted under a Creative Commons (Attribution, Non-Commercial, Share Alike) License on Vimeo. I replied that this wasn’t so easy as the video contained background music that was licensed for non-commercial use only, but I would be willing to send them the original video w/o the music and grant them the desired licence for “perpetual” (de facto unlimited) use for 35 pounds (my suggestion based on the rate for local newspapers) license fee. To be honest, I was astounded that what I had learned to be the “gutter press” would even care to ask before publishing stuff. Was I mistaken? Of course not. I never got a reply. Instead they just took the video, edited it (getting rid of a beautiful view of the Porta Nigra) and put it on-line on their website. No money for the person who shot the video–my name is given at least (see screen shot). Nothing for the musician whose music is in the background. Yes, it probably qualifies as a quote from the web. I shouldn’t complain, should I? After all, I am confirmed in my disgust for the yellow press. But why did they ask in the first place? 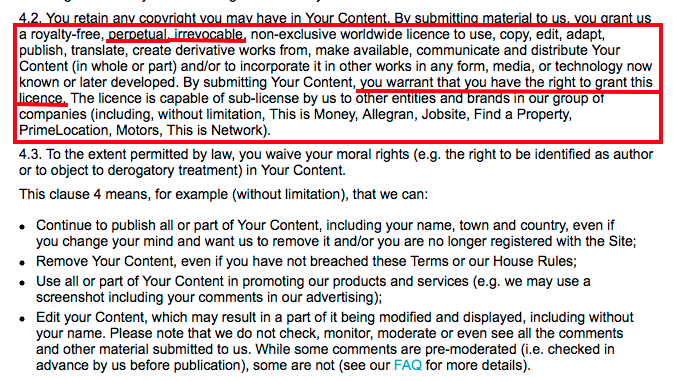 Simple: If you agree to give them the stuff for free and forever–irrevocably–, and for their offshoot channels as well, you warrant that you have the full copy- and usage rights. So, if a musician like the one bamboozled by the publication, comes and wants money, they can send them to you. Not only do they want owt fer nowt. They also want to pass the buck to others if things go wrong (see below). Clever people they are for sure. Und deswegen, unter anderem, ist und bleibt ein Drecksblatt eben ein Drecksblatt. Williams, Amanda. 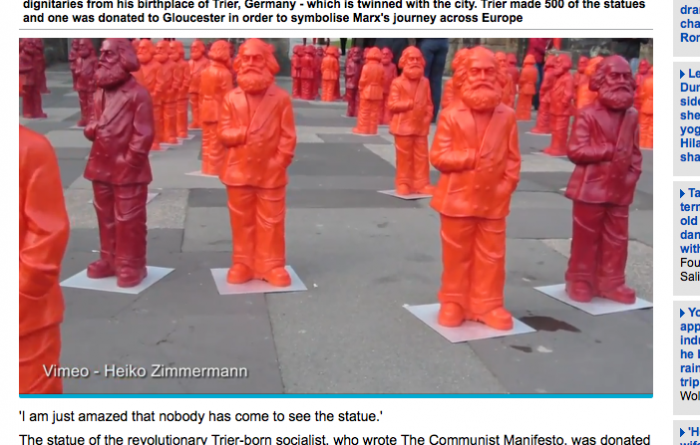 “Red Statue of Karl Marx Gifted to City of Gloucester Is Hidden Away.” Mailonline. 4 Mar. 2015. Web. Rebecca Hutson (I believe she is Director of Video at MailOnline) contacted me today saying that they have not received my email to the video editor (see above), that she had learned about my suggestion from my blog post and that they would like to pay a license fee of 35 pounds and swap the video they have on their website for the original file (thereby getting rid of the problem of the background music which is licensed under a CC-BY-NC-SA license). I agreed and uploaded the original video for the Daily Mail to download and use (and mentioned that I don’t own the rights to the art installation or the sounds you could hear in front of Porta Nigra on the day I took the video). Let’s see: If they pay a license fee, is this still “freebooting”? Not any longer. Is posting without prior clearance poor style? In most cases, I’d think it is. Is my ranting about poor style poor style, too? Maybe. Am I biased? Yes. Dass die FAZ von Zeit zu Zeit Kampagnen ohne Rücksicht auf die eigenen sonst inszenierten Qualitätsmaßstäbe fährt, ist m. E. bekannt (hier sei nur an die Rechtschreibreform erinnert). Marcel Weiß analysiert in seinem Text “Google-Krieg der deutschen Medien: Die Masken sind jetzt gefallen” bei neunetz.com: Wirtschaft im digitalen Zeitalter einen FAZ-Artikel von Jürg Altwegg. Leseempfehlung. Allerdings weiß ich nicht, ob der Weiß’sche Schluss nicht vielleicht doch zu radikal ist: Die kommerziellen Massenmedien seien nicht für eine demokratische Meinungsbildung geeignet. Schließlich zeigt der Text von Weiß, dass man diese Texte auch entlarven kann. Mein Schluss wäre, dass Medien oft nicht “neutral” über Themen berichten, die sie selbst direkt betreffen. Der FAZ-Artikel von Jürg Altwegg in der FAZ ist aber höchstens ein bisschen peinlich. Ich schäme mich ein bisschen fremd, wenn ich die zitierten Auszüge lese. Da schreiben Journalisten sich um Kopf und Kragen… Man muss natürlich überlegen, was aus dieser fehlenden kritischen Distanz folgt, wenn in der nächsten Zeit, den formativen Jahren des Internetzeitalters immer wieder besonders die Struktur und die Inhalte der Medien, ihre Vertriebsstrategien, veränderte Rezeptionsweisen und sich verschiebende gesellschaftliche und politische Rahmenbedingungen diskutiert werden müssen. Ich glaube, dass sich diese herkömmlichen Massenmedien zur Distanz zwingen und den Ton neutral halten sollten, weil sie sonst schneller weg vom Fenster sein werden, als sie sich jetzt vorstellen können.